Gen Con Day 1 – Driving – Whose Turn Is It Anyway? If I have mastered the automatic posting feature of WordPress, this post should be coming to you while I am on the road. Today, I am driving from Emmaus, PA to Indianapolis, IN. There are a lot more road construction signs than I’d like to see on this map, but I will stay hopeful. I suppose I could have considered yesterday my Gen Con Day 1 as I was driving to PA from NH to drop my children off at my mother-in-law’s house. I’m sure it was not a fun six hour drive, and I’m sure I was praying for the day to end by the time I arrived. If the 11th of August went as planned, I am driving to Gen Con with meat sticks from my favorite store in Pennsylvania, Dietrich’s. If you like smoked meats, cheeses, and other Pennsylvania Dutch delicacies and are in the area, I highly recommend this place. I’m hopefully enjoying Sweet Stix, which are my absolute favorite thing to buy from here. It’s normal to start a road trip by purchasing five pounds of meat, right? I thought so. The only place you need to shop in Lehigh Valley PA. I hope all you vegetarians out there appreciate the fact that I didn’t post a picture of processed meat in this post. I’m not saying there won’t be a picture on twitter at some point today, but I figured I’d do you all a favor and saving you from the butchered deliciousness. What am I doing other than eating smoked meat today? Here’s my tentative driving itinerary. It won’t be very exciting as it’s a 624 mile drive from Point A (PA) to Point B (IN). Almost 10 hours it says, I won’t tempt the road trip gods by saying I can do better than that, so we’ll stick with the Google’s estimate. 5:00 am – Wake up. Wonder why I am leaving so early in the morning. Get ready. Wave goodbye to my children. (It’s five in the morning – they won’t be up yet. I’m not that heartless. Let sleeping dogs lie.) Leave. 5:30 am – Take the first sip of an Iced Venti Hazelnut Macchiato. Decide maybe leaving this early isn’t so bad after all. 11:30 pm – Fill up the gas tank. Empty human tank. Possibly grab something other than Sweet Stix to have for lunch. At this point, if the Google is to be believed, I have four more hours of driving to do. 12:00 – Hit the road, Jack. 4:00 pm – Arrive at Gen Con. Park at hotel. Lug my suitcase up however many flights of stairs it takes to to get to my room (I don’t use elevators. I’m like Cary Grant that way). Meet roommates. Unpack. 5:00 pm – This where the schedule falls apart/opens up. Maybe I’m out at dinner, walking around, seeing the sights. Maybe I’m passed out from driving exhaustion. Who knows? 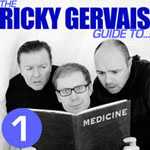 The Ricky Gervais Guide To…series. I have listened to these before, and they’re all hilarious. If nothing else, Ricky’s laugh will serve as random alarms to make sure I’m not dozing. Some of these I’ve listened to before. Some of them are brand new to me. Some were recommended. Some were chosen based on their fondness for dance offs as the answer to world problems. You get the idea. 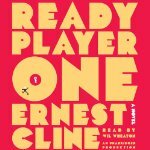 The Bill Bryson books and Ready Player One were recommended to me. The rest I found while dabbling on audible.com. That was a mistake. SO many books I want to listen to solely because of the person they have reading them. Sigh. Some of this list comes from others. Some of it comes from the iPod I found rummaging through a box.